board. We are inspected each year on the safety equipment that we carry and to ensure the boats are seaworthy. Both can be used to SCUBA dive or Snorkel or a combination of both. We find that our groups really like the intimacy of the small group and its real easy to make new friends on our boats. Island Ventures had a new engine in April 2017 and now runs super sweet. We licensed for 15 divers on each but generally only have a maximum of 10 divers. This ensures everybody is comfortable with enough space to gear up. We want you to have the best experience possible! Diversity had a new engine in April 2018. 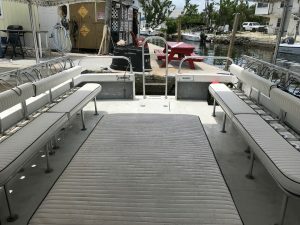 Some additional upgrades include new seat covers to make snorkeling super comfortable. 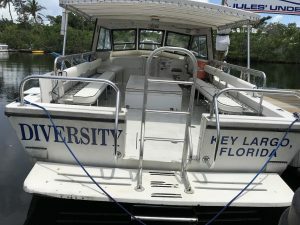 Both of our boats have a cover over the seating are so you can keep out of the strong Florida sun. We carry reef safe sunscreen on board each boat that is free to use. We would prefer that you use our sunscreen to help protect our reefs. For those who have longer hair we have a fresh water wash down and leave in conditioner that is also reef safe and free to use! Seats on Diversity make trips to the reef super comfortable. There is ice cold water and cookies! 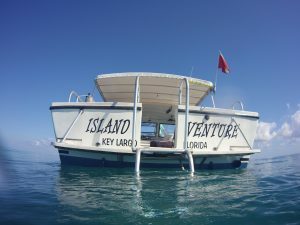 Access to the reef from our boats is simple and quick with the ladders at the rear the platform is almost on the water so you do not have far to jump!